Approximately $150,000 invested in build Polished and smoothed engine bay 427/600 HP V-8 engine modified by P.I. Motorsports, INC. in Orange, California Twin-tank NOS system 850 CFM Demon carburetor Hydraulic roller rockers Forged crankshaft 10.5:1 compression Victor Jr. heads and intake manifold Ceramic coated headers Performance exhaust and mufflers ZF 5-speed transaxle Chromed suspension and drivetrain Chromed cooling system components Wilwood 4-wheel disc brakes Drilled and slotted rotors Silver Metallic paint Custom hand-crafted Black leather interior Crow racing belts Kenwood stereo system Upgraded electrical system Center console with gauges 18 inch HRE 2-piece wheels Michelin Pilot Sport tires The DeTomaso Pantera was as anachronistic as any car could get in the fuel-starved, inflationary wasteland that was the 1970s. The snarling mid-engine Italian-American hybrid landed on the United States shores bristling with style and brawn, only to find the muscle car party was all over but the crying. But all things must pass, and today the thirst for power on four wheels can be slaked any number of ways. Whereas once the Panteras 300-plus HP was enough to blow almost anything else off the road, today that figure is the province of upscale SUVs. 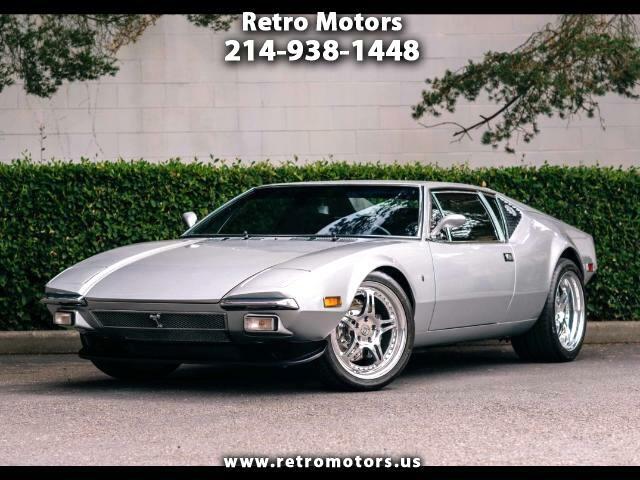 The previous owner of this 1974 DeTomaso Pantera wanted 21st century performance and the looks to go with it, and turned to Pantera specialists P.I. Motorsports of Orange, California to execute the transformation. First addressing the heart of the matter, P.I. packaged a Ford 427 FE engine with everything it needed to deliver the goods: a forged crank, 10.5:1 compression, Edelbrock Victor Jr. heads and intake, hydraulic roller cam and rockers, ceramic coated headers and stainless exhaust system. Topped off with a Demon 4-barrel carburetor and twin-tank NOS injection, the 427 big block delivers 600 HP and 600 lb-ft of torque. The powerplant and attendant ZF 5-speed transaxle were polished and chromed to a mirror-like finish and installed in the Panteras engine compartment, which was smoothed to match the rest of the cars virtually perfect Silver paint. Suspension, drivetrain and cooling system components were also chromed or polished, and the electrical system upgraded. Rolling on 18-inch HRE Forged 2-piece wheels and Michelin Pilot Sport Tires over Wilwood 4-wheel disc brakes, the car has been enhanced throughout while retaining its period feel, including an impeccable hand crafted Black leather interior with bucket seats and Crow racing belts, a modern Kenwood audio, center console with gauges and fully carpeted trunk. resto mod build on this spectacular Pantera. Updates all around for cooling, drivetrain, AC, suspension, interior, wheels, etc. As new from restoration. Gorgeous!